Q&A: Teaching Kids To Take Healthy Risks Risk-taking is a natural part of growing up. But sometimes teens take risks that are unhealthy or dangerous. NPR spoke to experts about the role of risk-taking in growing up, and how parents can help. Parents can work to protect their teens from dangerous situations by teaching and modeling how to take healthy risks in a safe environment. Part of raising a child is helping him or her define boundaries. It's a balancing act that requires knowing when to let a child take risks in safe environments versus taking risks in a situation where they could endanger themselves or others. NPR talked to two experts about the role of risk-taking in the teenage years, and how parents can help a teen engage in less risky behavior. Lynn Ponton is a professor of psychiatry at the University of California, San Francisco; Laurence Steinberg is a professor of psychology at Temple University in Philadelphia. What is the role of risk-taking in adolescence? Parents should realize that risk-taking is about the teen, not about the parent, says Ponton. "Teenagers engage in risk-taking behaviors to find out who they are, not to rebel or get back at the parent. In the 1960s, it was seen as rebellion. It's not that." Engaging in some risky behavior is not only normal, but it's necessary for teenagers, says Ponton. "It's a tool to define, develop and consolidate their identity. Healthy risk-taking is a big part of growth." People have to learn how to make good decisions and assess their risk in situations. "I don't see how they could grow up without risk-taking. We're a country of risk-takers. We have to learn to talk bout how we assess risk — that's hard." What are some examples of healthy risk-taking activities? Sports and developing artistic and creative abilities — be it through art or theater — are all activities that involve healthy levels of risk-taking. Teens can engage in volunteer activities, and even Internet activities. It can be as simple — and as scary — as getting up on stage, or asking somebody out, says Steinberg. All these behaviors may satisfy a teen's need to push boundaries, but are usually in an environment where there's very little harm that could result. What kinds of risks are unhealthy? Unhealthy risk-taking behavior includes driving too fast, texting or talking on the phone while driving, engaging in unsafe sexual practices, smoking and drinking alcohol to excess. Taken in a cluster, these behaviors could be life-threatening. And feeling the need to fit in can exacerbate poor decision-making. Steinberg conducted a study where he had teens driving on a simulator. Sometimes their friends watched them drive, and other times the friends weren't watching. 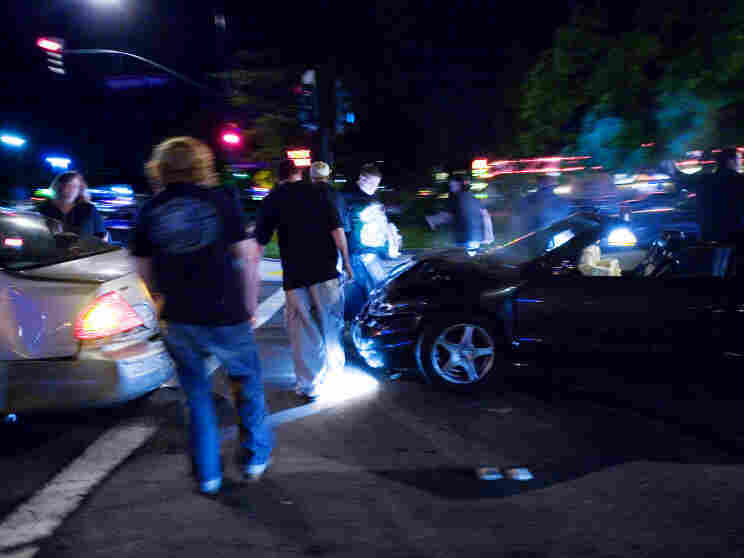 Even if a teen only thought friends were watching, they were twice as likely to crash the car than if they were alone. This is one of the reasons Steinberg says it's important to help teens avoid getting in situations where they harm themselves. In the case of driving, Steinberg says one solution is implementing graduated rules about driving, some of which are in states' laws — perhaps limiting a teen's ability to drive after dark or with other teens in the car. This allows the teenager to learn driving skills and gain experience. Risk-taking patterns develop early, stresses Ponton. From the time children are little, they're experimenting with taking risks, and they're watching their parents take risks. "I tried to talk to it as being more dangerous. I said, 'Look, I nearly went through that stop sign there, I'm going to pull over because nobody should be driving this way,' " she told her kids. It's important to "identify and recognize your own patterns of risk-taking," Ponton says. For many teens, their cell phones are an extension of themselves. They use their phones while they're at school, while they're in bed — even while they drive. And an increasing number of car crashes are caused by those distracted by cell phones. Experts are developing projects to stop teens and adults alike from texting in the car. Read the story. Steinberg agrees. "Teens who drink a lot often come from households where their parents drink a lot. Teens model their parents. Even though parents think their teens ignore them, they watch them." Clue into your child's and your own risk-taking patterns early, he says, and again, talk about them. Risk-taking as a teen matures is a process of exploration. And a child at 13 may not even realize certain behavior is risky. A child may take up an appropriate physical risk — say, swimming — but may be shy when it comes to meeting peers. Talk to him or her about it, and figure out ways to take some safe risks while the child is still young. Steinberg and Ponton agree: It has to be a dialogue, not a lecture. Steinberg notes, however, that "simply educating kids doesn't have much of an effect. So it's important to try to regulate the context in which kids live so they avoid getting in situations where they harm themselves." So try to engage a child in conversation and encourage behaviors that may fulfill the need to take risks, but are generally not harmful, such as sports. And give a child plenty of time to gain experience — learning how to take risks is a process. Radio story by Joanne Silberner.